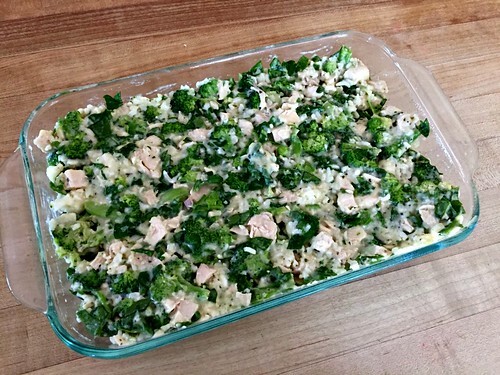 It is no secret that our family LOVES casseroles — and my extremely simple recipe for Chicken Broccoli Rice Casserole (shared on the blog 5 years ago) has always been a favorite. It is requested on a very regular basis, leftovers are fought over, and it’s just SO simple that I rarely ever complain when the kids request this meal. 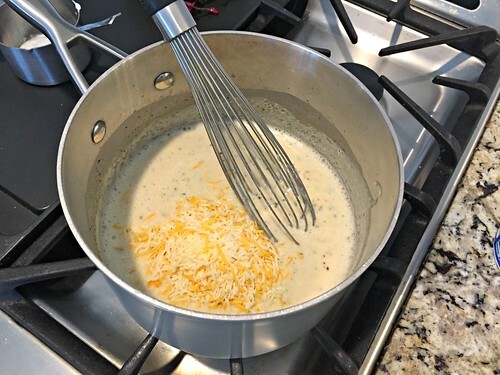 Over the past 5 years, I’ve experimented with several different version of this recipe — some using cream of chicken soup, different cheeses, different types of rice, etc. — all of which we seem to enjoy. However, a few months ago, I started experimenting with my own homemade sauce… and the kids really like it. 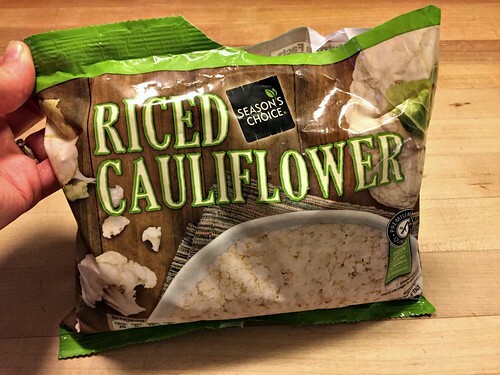 Then, last month, during my Aldi shopping experiment, I found cauliflower rice in their frozen section for only $1.50 for a one-pound bag — already riced, parboiled, and ready to go. I figured my family would freak out if I took their beloved rice out of chicken broccoli rice casserole… but to my surprise, no one even noticed! If you’ve never used cauliflower rice before, you’ll most likely be shocked with how similar the flavor and texture are! Of course, you may gladly use regular rice in place of the cauliflower rice — I just wanted to mention how pleased I’ve been with the taste and texture of frozen cauliflower rice, in case you’ve wondered about giving it a try. Since I use frozen “rice”, frozen broccoli, frozen spinach, and pre-cooked chicken from my own freezer, I can get this meal in the oven in roughly 15 minutes. Then I use the baking time to clean up the kitchen, set the table, make a few simple side dishes (applesauce, rolls, leftover oven roasted veggies, fresh fruit, etc.) and we’re ready to eat a pretty substantial meal just over 30 minutes after I entered the kitchen. Not too shabby, my friends! If you’re looking for a slightly more nutritious, veggie-loaded, completely from-scratch, yet still VERY simple alternative to this family favorite recipe… I’ve got you covered! ** you can swap regular rice for the cauliflower rice, but you’ll need to cook it first, and then use 2 cups COOKED rice in place of the 2 c. frozen cauliflower rice. 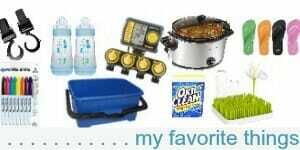 Grease a 9″ x 13″ casserole dish and set aside. 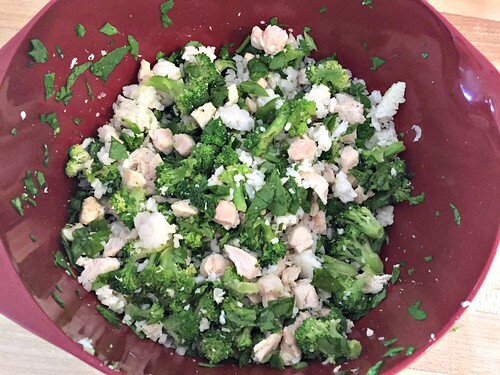 In a large bowl, mix chopped broccoli florets, cauliflower rice, chopped spinach, and cooked chicken. Set aside. In a sauce pan, heat broth, milk, spices, and flour over medium heat. Use a whisk to incorporate the flour and stir until mixture thickens (7 minutes or so). 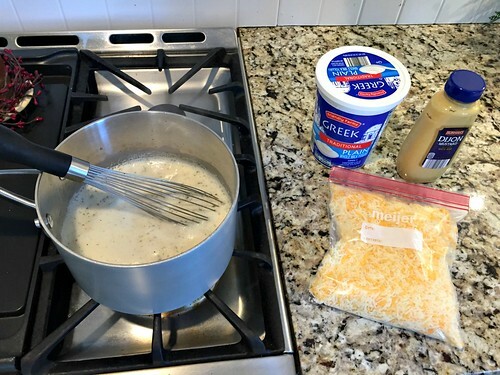 Remove pan from heat and stir in mustard, yogurt, and 1/2 c. shredded cheese. Taste the sauce and add salt as necessary. Pour sauce over chicken, broccoli, and “rice” and stir to combine. 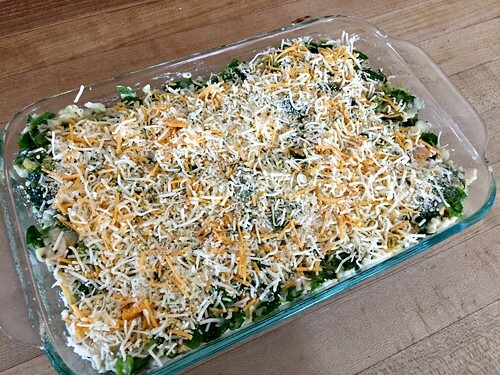 Scoop mixture into greased baking pan and add additional 1 c. shredded cheese. Bake in preheated oven for 20 minutes or until center is hot and cheese is bubbly. Obviously, the ingredient list is longer than my super simple recipe from 5 years ago… BUT, they are (in my opinion) very regular ingredients that I always have in the house. Just a bunch of spices, some broth, a few condiments, and then the chicken, broccoli, spinach, and “rice”. I was honestly SO shocked when no one mentioned anything about the different rice — in fact, Nora and Simon ate their first portion so quickly and were asking for seconds before Dave and I even finished half our plate! In my opinion, there is nothing bad or wrong about including real rice instead of cauliflower rice; however, in an effort to eat more veggies these past several months, the cauliflower rice has been a great swap for our family! 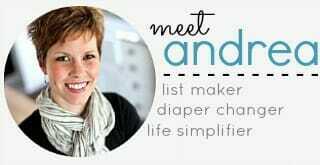 And as always, visit my virtual recipe box for more simple, delicious, family friendly recipes? So excited to try this! I love all the veggies in it. 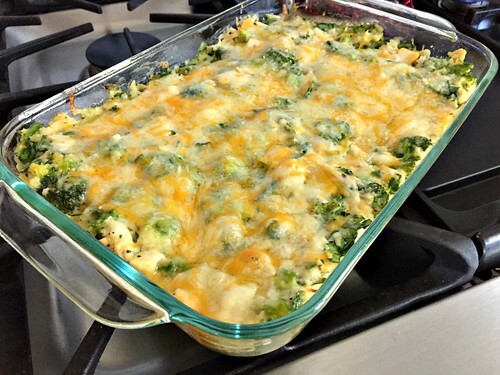 And I do love casseroles – the healthier the better. Also…i just made some rice today and I have a bunch left over – I might have to just make your fried rice again…yum yum! 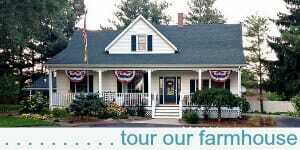 This is one of our favorites too! People need to be aware that some riced cauliflower has additional ingredients that are not cauliflower! Trader Joe’s has a frozen bag — it’s cut in itty bitty cubes and takes three times what the package say for cook time. They have it fresh also in the produce aisle. Or you can use a food processor and do it yourself very quickly and it’s easy cleanup since it’s not sticky or greasy. Just rinse the bowl and blade well. My other trick is to use an additive free cream cheese. Soften in microwave in a big measuring cup and whisk in the milk and broth to the right consistency. Gluten free this way and no cooking and stirring to thicken. We use the cream cheese for our faux twice baked potatoes (steamed chunks of cauliflower with faux white sauce, tons of cheese, green onions and broken up pieces of uncured bacon. Macaroni (we call it Mac A Phony ) made same way using smaller chunks. No bacon or green onions, just a touch of good quality mustard. Finding gum free cream cheese is such a challenge. I’ve found a brand in California from the Sierra Nevada Cheese Company. Not sure if they ship. I’m lucky it’s only 5 miles to the store that has it. I can’t wait to try this! I like simple recipes that will give us leftovers or one that can be made for when we have company. Healthy and delicious at the same time! yes, leftovers are one of my favorite things about casseroles! You won’t have leftovers long…four growing kids! I have three teens and the days of leftovers are over! Yay! Thanks for this. Your original is in regular rotation at my house. I’m excited to give this one a try. Thank you so much for this recipe. I know how time consuming it can be to take a recipe that’s in your head and put it on “paper”. I appreciate you taking the time to do that for us. I am so excited to see it without the canned soup also. Sorry for the second comment, but I forgot to ask. I don’t usually keep Dijon mustard on hand, can regular mustard be substituted without altering the taste too much? Dijon mustard is amazingly versatile. 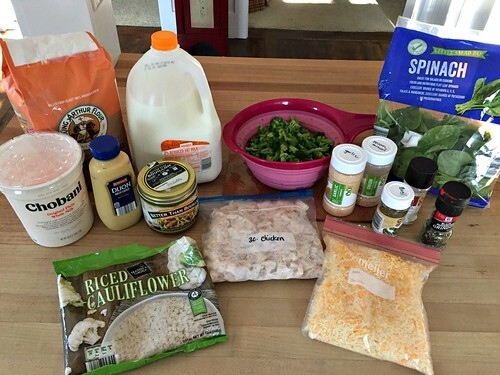 I use it in a lot of cooking like rolling boneless chicken breasts strips in it with green onions and then baking. Whisk it into oil and vinegar dressing and it makes an emulsion and the dressing won’t separate. 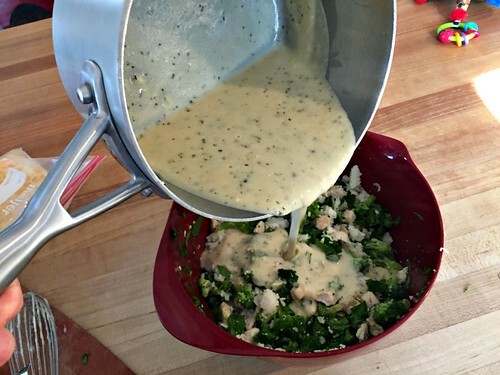 Whisk a little bit into home made mayo and drizzle on asparagus or broccoli. It doesn’t cost much and a little goes a long way. Yellow mustard can contain gluten or other allergens, so I try to use brown grainy or Dijon. And you haven’t lived till you’ve driven through the area of France where it’s made. It’s beautiful. Yellow as far as the eye can see. We brought 4 jars back only to find it’s sold here. Maile is the best! Thank you very much for this information. Perhaps I’ll buy a bottle and experiment a little. They even have Dijon mustard at Aldi, although I prefer the Grey Poupon. Try it and see. yes, that’s where I found my dijon mustard! I think it was only $0.69! 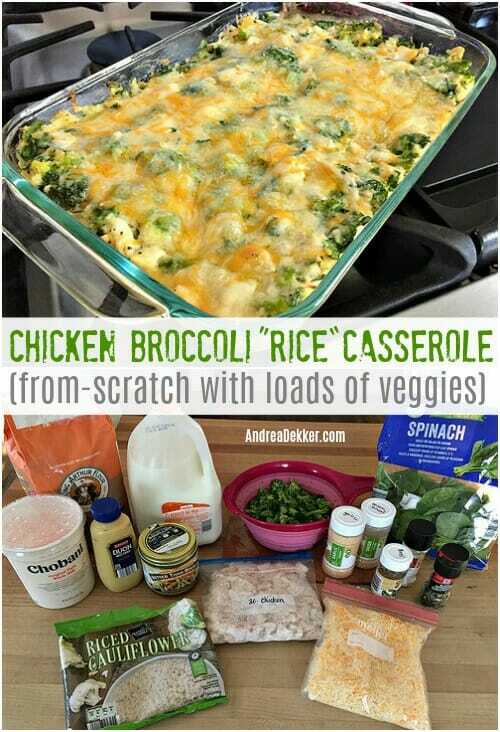 Chicken Broccoli and Rice is my favorite casserole too! Can’t wait to try it with the riced cauliflower. So glad to see that you made your own sauce, I try to stay away from canned soup whenever possible. Thanks for posting the recipe. thanks Aggie! Hope you love it!! !